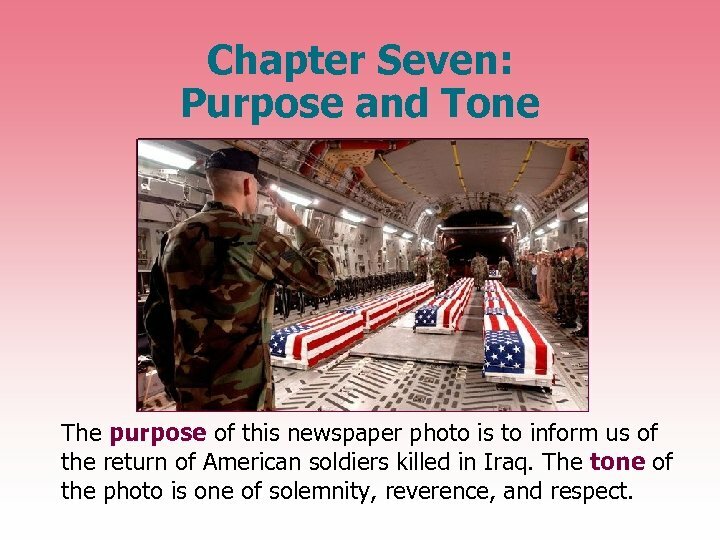 Chapter Seven: Purpose and Tone The purpose of this newspaper photo is to inform us of the return of American soldiers killed in Iraq. The tone of the photo is one of solemnity, reverence, and respect. 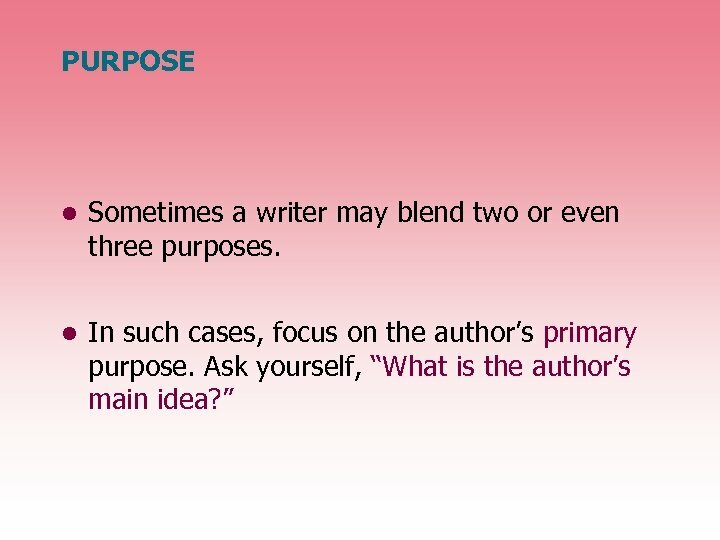 PURPOSE Three common purposes (reasons for writing) are • To inform — to give information about a subject. 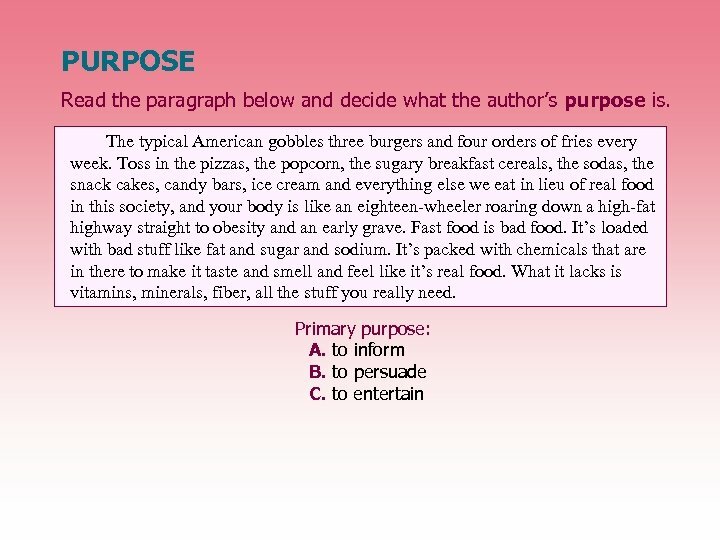 • To persuade — to convince the reader to agree with the author’s point of view on a subject. • To entertain — to amuse and delight; to appeal to the reader’s senses and imagination. PURPOSE The typical American gobbles three burgers and four orders of fries every week. Toss in the pizzas, the popcorn, the sugary breakfast cereals, the sodas, the snack cakes, candy bars, ice cream and everything else we eat in lieu of real food in this society, and your body is like an eighteen-wheeler roaring down a high-fat highway straight to obesity and an early grave. Fast food is bad food. It’s loaded with bad stuff like fat and sugar and sodium. It’s packed with chemicals that are in there to make it taste and smell and feel like it’s real food. What it lacks is vitamins, minerals, fiber, all the stuff you really need. 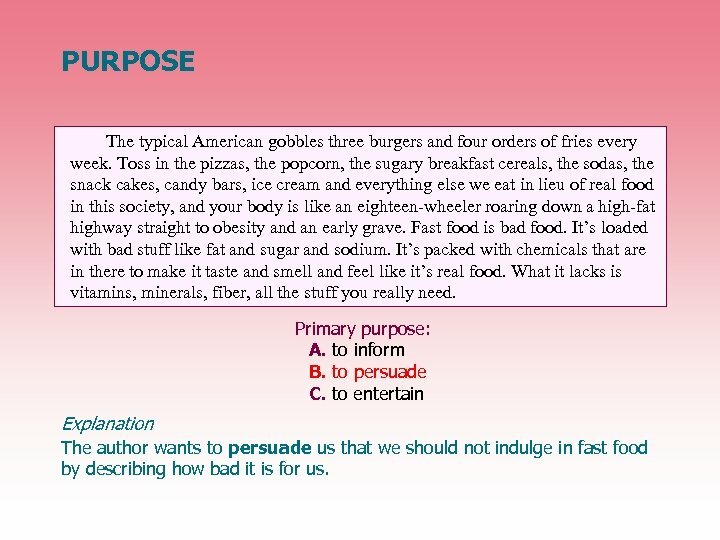 Primary purpose: A. to inform B. to persuade C. to entertain Explanation The author wants to persuade us that we should not indulge in fast food by describing how bad it is for us. PURPOSE Personal contact is necessary for common cold viruses to spread. The viruses must get into the nose, where they can infect the nasal membranes. Inhaling contaminated droplets produced when someone else coughs or sneezes may be one way to catch a cold. Cold viruses can remain infective even if they are outside the body for a few hours. Therefore, you can also catch a cold if you handle something that is contaminated with a cold virus—for example, the doorknob of a classroom or a restroom door—and then scratch your nose or rub your eyes with your contaminated fingers. The cold viruses can reach your nose when you rub your eyes because the virus can be passed down the tear ducts that go from the eyes into the nasal cavities. 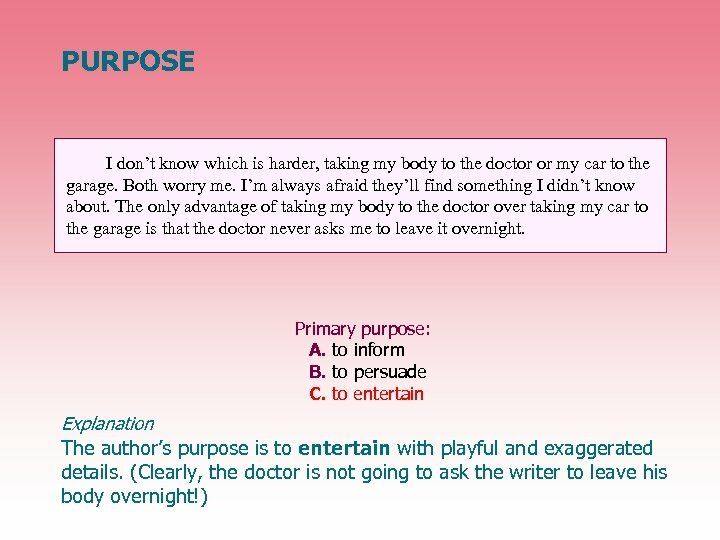 Primary purpose: A. to inform B. to persuade C. to entertain Explanation The author’s purpose is to inform the reader about how cold viruses spread by presenting facts about the kinds of personal contact that can lead to infection. 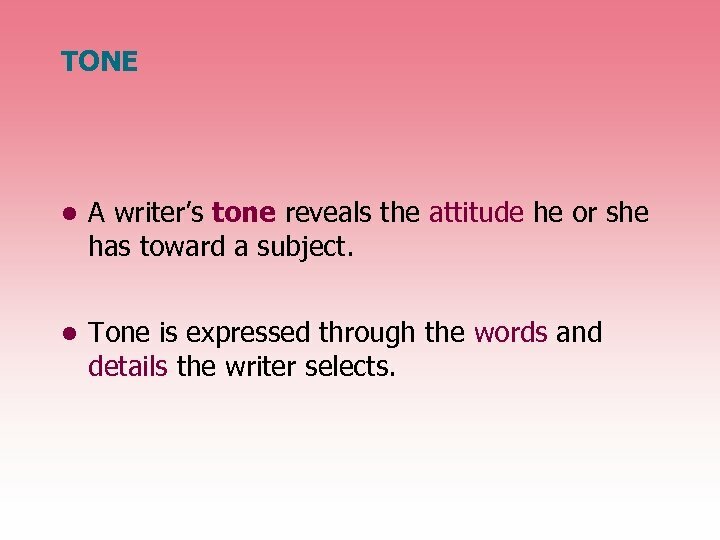 TONE • A writer’s tone reveals the attitude he or she has toward a subject. • Tone is expressed through the words and details the writer selects. TONE Here is another statement by a student of the demanding teacher. 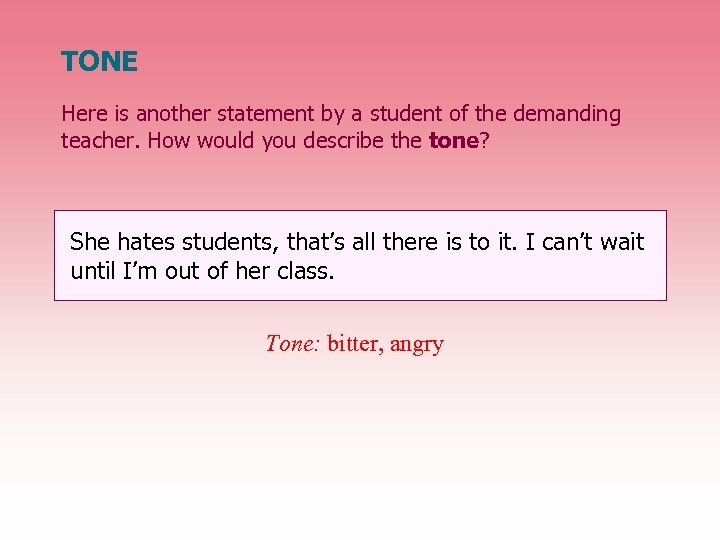 How would you describe the tone? She hates students, that’s all there is to it. I can’t wait until I’m out of her class. 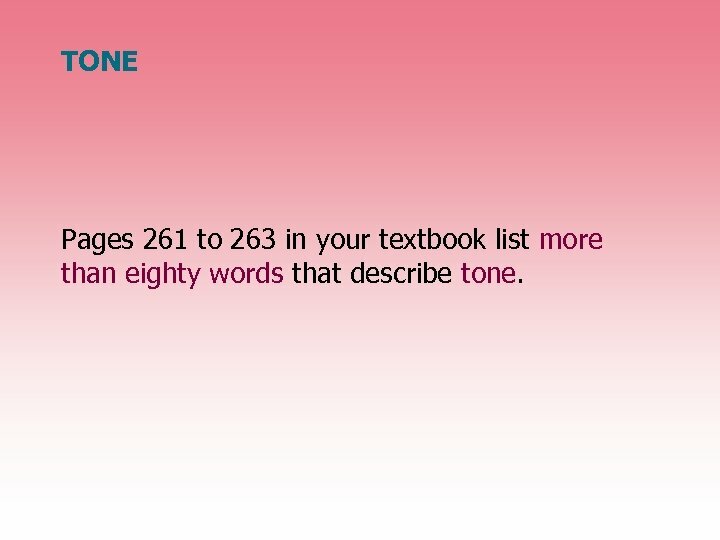 TONE Pages 261 to 263 in your textbook list more than eighty words that describe tone. 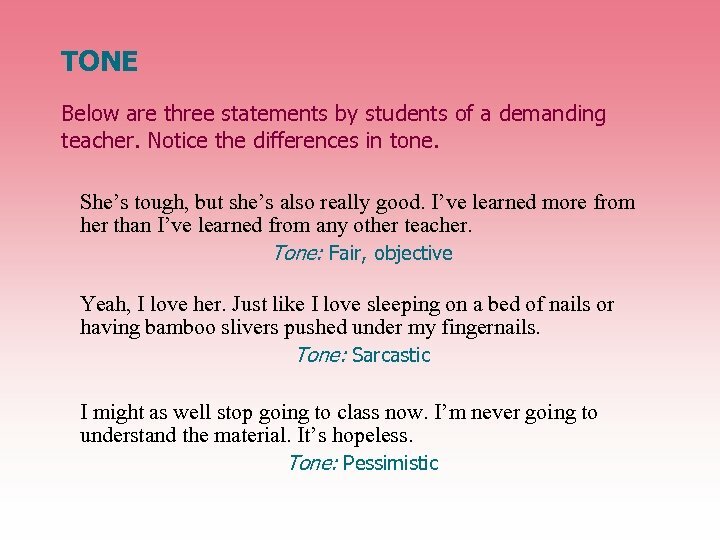 TONE What is the tone of each of the following statements? Wal-Mart may create an economic underclass in our town. Its employees aren’t paid enough to live on, and they have very poor benefits. 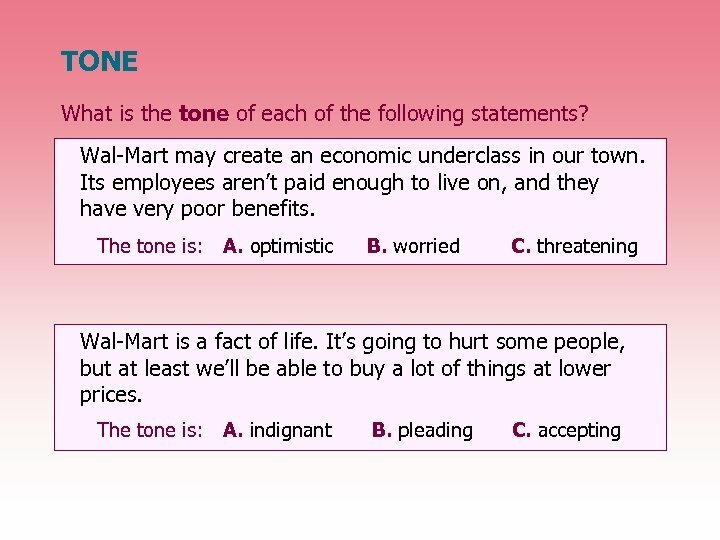 Explanation The tone is: A. optimistic B. worried C. threatening The writer’s concerns that Wal-Mart’s low wages and benefits may have a negative economic effect on the town suggests a worried tone. Wal-Mart is a fact of life. It’s going to hurt some people, but at least we’ll be able to buy a lot of things at lower prices. 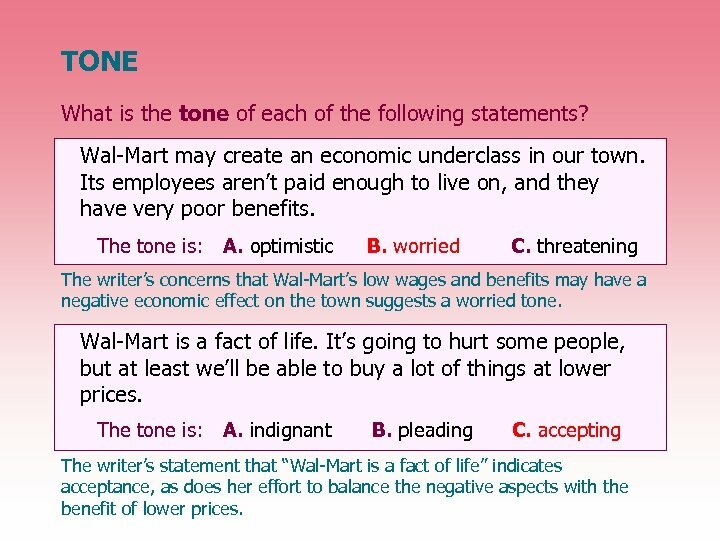 The tone is: Explanation A. indignant B. pleading C. accepting The writer’s statement that “Wal-Mart is a fact of life” indicates acceptance, as does her effort to balance the negative aspects with the benefit of lower prices. 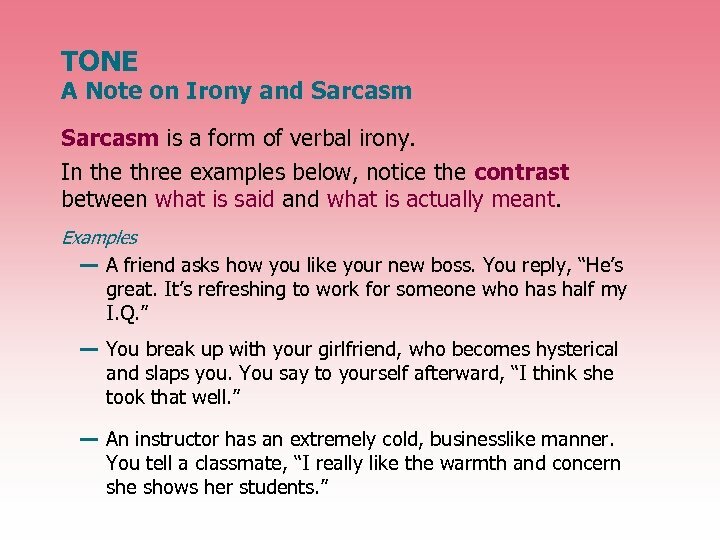 TONE A Note on Irony and Sarcasm • One commonly used tone is irony. • Irony involves a contrast between expectations and reality. 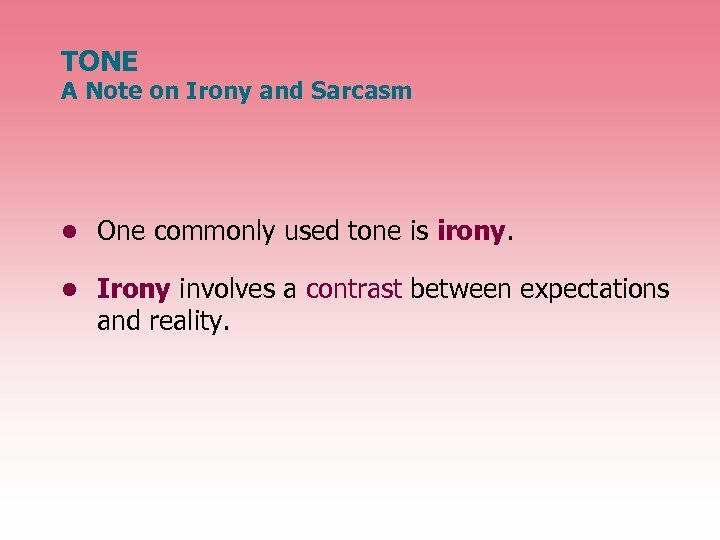 TONE A Note on Irony and Sarcasm • Irony also refers to situations that involve a contrast between what is expected or intended and what actually happens. • In the two examples below, notice how what actually happens is contrary to what is expected or intended. Examples — While fastening his seat belt to keep himself safe, a man loses control of his car and crashes. — Ludwig van Beethoven, perhaps the greatest composer who ever lived, became totally deaf and could not hear his own music. TONE A Note on Irony and Sarcasm Frank and Ernest © by Thaves. All rights reserved. What is the irony in the sign that a communication workshop will be “sometime tonight in a room upstairs”? 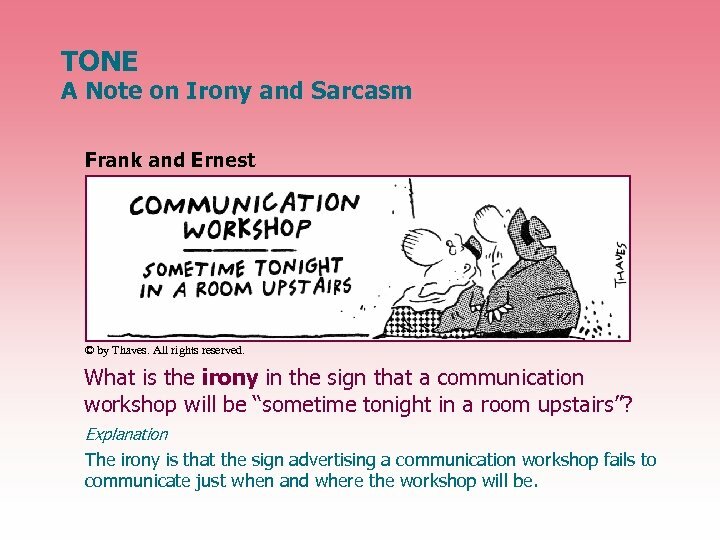 TONE A Note on Irony and Sarcasm Frank and Ernest © by Thaves. All rights reserved. What is the irony in the sign that a communication workshop will be “sometime tonight in a room upstairs”? Explanation The irony is that the sign advertising a communication workshop fails to communicate just when and where the workshop will be. 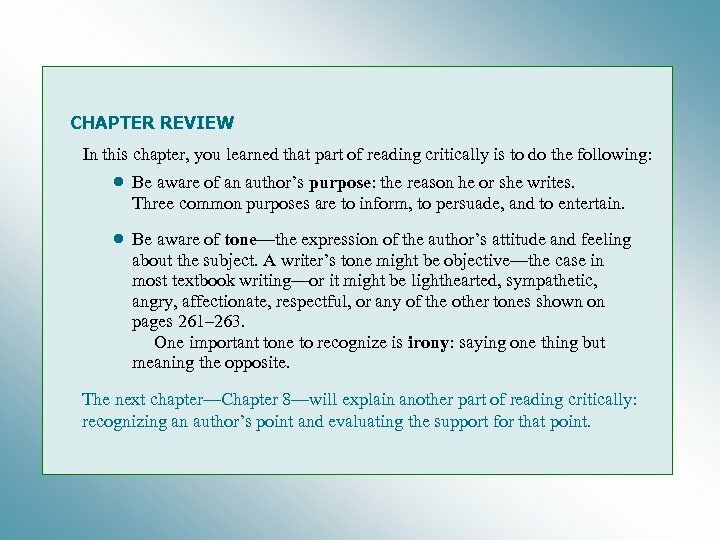 CHAPTER REVIEW In this chapter, you learned that part of reading critically is to do the following: • Be aware of an author’s purpose: the reason he or she writes. 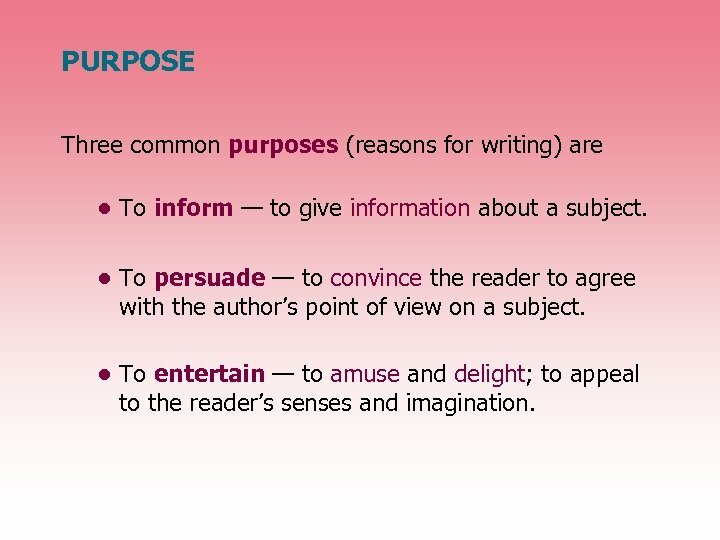 Three common purposes are to inform, to persuade, and to entertain. 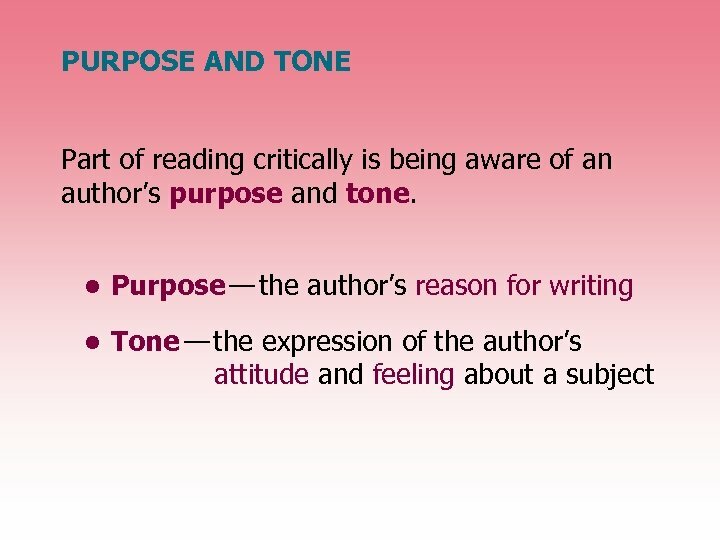 • Be aware of tone—the expression of the author’s attitude and feeling about the subject. A writer’s tone might be objective—the case in most textbook writing—or it might be lighthearted, sympathetic, angry, affectionate, respectful, or any of the other tones shown on pages 261– 263. 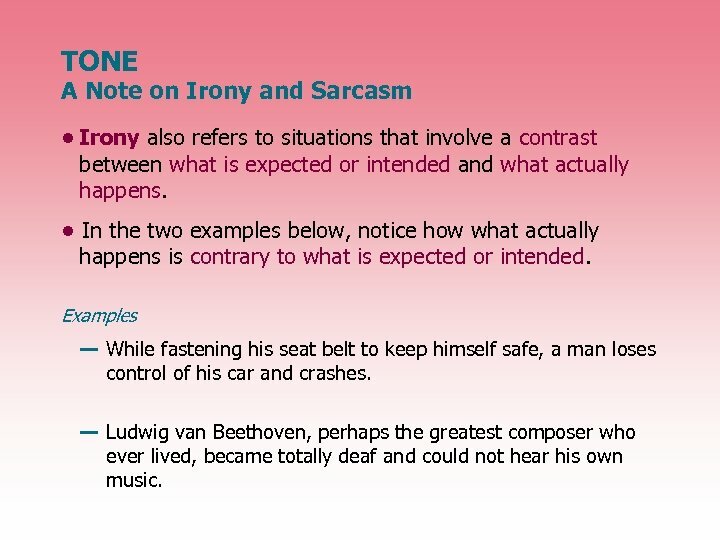 One important tone to recognize is irony: saying one thing but meaning the opposite. 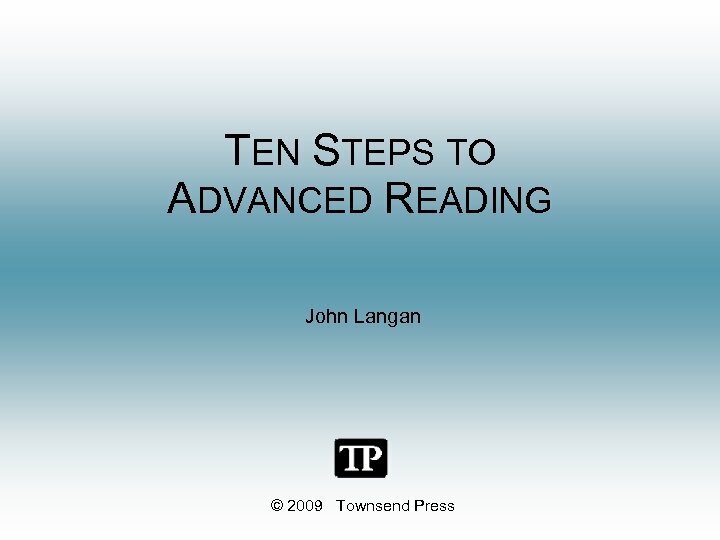 The next chapter—Chapter 8—will explain another part of reading critically: recognizing an author’s point and evaluating the support for that point.